The ostrich is the largest living bird, lays the largest egg of any living avian species, and has the largest eyes of any terrestrial vertebrate. 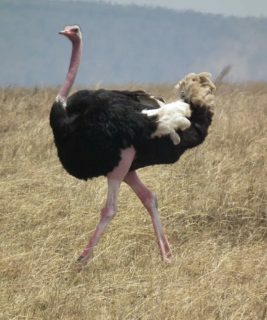 Ostriches are in the same order, Struthioniformes, with the other flightless living species, kiwis, rheas, emus, cassowaries, and the extinct moa and elephant bird. The plumage on males is mostly black, with white primaries and tail feathers. The females and juveniles are grayish-brown instead of black. Unlike flighted birds, which have fine hooks on their feathers to hold them together, ostriches have long, fluffy, hookless tail plumes that act as insulation. The ostrich neck is covered in a light down and the legs are bare and scaly at the extremity. Unlike most birds, which have four toes, the ostrich only has two. The largest toe has a claw similar to a hoof that can disembowel a human in a single blow. Its long, powerful legs allow it to reach speeds of 79 km per hr. (43 mph). The wings are used primarily in mating displays, but also to provide shade from the harsh sun for the offspring. The males are somewhat larger than the females. Ostriches have many natural predators that occurred in the Arabian Peninsula until recent historic times. 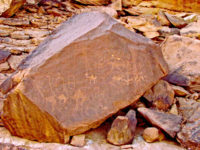 These include the lion, leopard, cheetah, spotted hyena, and humans. Jackals will also attack the nests and take juveniles. Ostriches yield many useful products: meat, plumes, extremely tough skin for making leather, and eggs that can be eaten and whose shells can used as containers and other artifacts. Ostriches prefer open land and are native to savannas, semi-desert and true desert, below 100 m (330 ft) elevation. The range of ostriches once included East Africa, Africa north and south of the Sahara and south of the rain forest belt, as well as much of Asia Minor and the Arabian Peninsula. Today they occur in the savanna and Sahel north and south of the equatorial forest zone, as well as southwest Africa. The Arabian Ostrich (Struthio camelus syriacus) once inhabited a continuous range covering the Arabian Peninsula and the Near East. 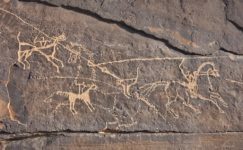 With the Holocene desertification and creation of the Rub’al-Khali, the subspecies was reduced to just two relict populations: a small one in southeastern Arabia and a larger one in the region where Saudi Arabia, Jordan, Iraq, and Syria meet. 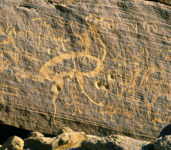 In ancient times, the Arabian subspecies probably intergraded with the North African subspecies S. c. camelus in the Sinai Peninsula. S. c. syriacus lingered from the Syrian Desert to the northern Nefud, to the Euphrates River. It was most numerous in Al Jawf Province, in northern Saudi Arabia, bordering Jordan, where it was associated with herds of the Saudi Gazelle (Gazella saudiya), now also extinct, and the Arabian Oryx (Oryx leucoryx). The Arabian Ostrich was hunted to extinction by the middle of the 20th century. 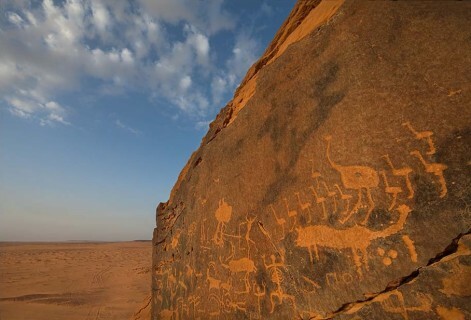 The last reported Arabian Ostrich died in Wadi el-Hasa, north of Petra, in Jordan, in 1966. 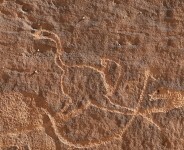 The ostrich is depicted in Saudi petroglyphs all through time. It is shown being hunted by humans, but females are also shown with their chicks. 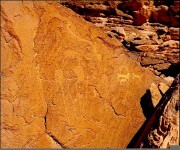 This is one of the best known and most visited examples of Saudi Arabian rock art, located not far west of Riyadh. 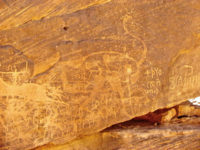 This prominent panel bears a wide diversity of animals and numerous battle scenes.